Serious gardening requires an equally serious approach to watching the weather – one of the key components for a luscious garden. In other words, if plants and flowers are not getting enough water and sunlight, all your other efforts might be in vain. The best way to stay on top of one’s gardening is to invest in a weather station, but there is always the question of which one to get. Since so many budding gardeners are asking this question, I’ve created a list of the best weather station for gardeners, regardless of their skill level. What Is a Weather Station for Gardeners? In a nutshell, gardening weather stations are usually wireless units that measure precipitation and temperature – the two basic variables for successful gardening. However, most contemporary gardening weather stations go beyond that to include advanced features like moisture sensors and Wi-Fi connectivity. It is advisable to always go for a Wi-Fi-enabled weather station with the most number of sensors. This’d provide the users with more flexibility and data so they can tweak the gardening routine to the exact needs of the plants. Gardening weather stations need to have a few key features to ensure backyard plant life that your neighbors will envy. In today’s world, there is no reason not to get a Wi-Fi-enabled weather station. Some of them might be slightly more expensive but the increased usability is well worth the money. 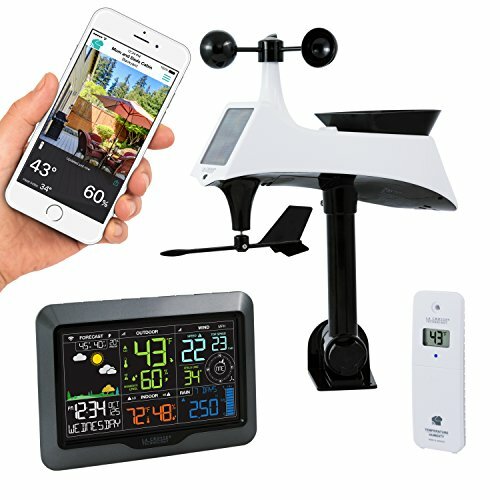 With a Wi-Fi-enabled weather station, you can closely monitor all of the weather parameters in the garden from a computer or a mobile device. In addition, weather tracking apps allow users to prepare the garden for looming weather conditions and avoid potential disasters. As mentioned, precipitation and temperature are vital for the plants’ well-being. But if the plants require some extra care, you should surely consider getting a weather station with leaf and soil sensors. An anemometer wouldn’t hurt either; it can help prevent wind damage and aid in pesticide spraying and other wind-sensitive activities. All of the gardening weather stations I’ve chosen for this write-up come with wireless connectivity. The wireless range is how far you can have the measuring unit apart from the main console. It usually starts at 300 feet and goes all the way up to 1,000 feet. For most gardening purposes, a 400 ft. range should be more than enough, unless you have a massive property. This weather station from La Crosse Technology has all the bells and whistles to cover the needs of any gardener. It is a wireless unit with an ample 400-ft. wireless range. The unit comes with a remote control panel which shows indoor and outdoor temperatures, wind and rain data, and humidity measurements. What I particularly like is the connectivity. It allows the V40-PRO-INT to pull information from the National Weather Service to include a more comprehensive weather forecast. On the other hand, the built-in Wi-Fi system sets this weather station apart from the competition. Users have the option to monitor all weather parameters via the La Crosse View App. The app even supports shared family and friends accounts and push notifications. This weather station does not need Wi-Fi to work. The Swiss-made humidity and temperature sensors work in perfect tandem with the other sensors to deliver accurate data to the remote control panel. The panel has a large LCD display with color-coordinated measurement indicators. The menus on the panel are easy to navigate and there is an option to adjust the screen’s brightness. The AcuRite 01536 weather station is a 5-in-1 unit which delivers all of the measurements vital for professional gardening. The station allows users to measure wind direction and speed, temperature, humidity, and rain levels. The unit also features an exceptional full-color display which makes measurement readings a breeze. The display also provides an estimation of what the outside temperature feels like – a feature not too many weather stations include. The AcuRite 01536 can easily be connected to your computer as well. This weather station compensates for the lack of Wi-Fi connectivity with enhanced options to connect to a Mac or PC. Users can simply connect the display unit to their computer via a USB cable and view all of the data remotely on a browser or mobile device. Besides the exceptional weather sensors and enhanced connectivity, the AcuRite 01536 is capable of taking accurate temperature measurements down to -40° Fahrenheit and has a decent 330-ft. wireless range. What’s more, this weather station is easy to install and comes with a battery that lasts up to two years, which keeps the maintenance to a minimum. The Netatmo is the best weather station for gardeners who are very future-forward. But this doesn’t mean others will have troubles using this station. The weather station has a sensor unit design unlike any other and offers seamless integration with its native Wi-Fi app. When it comes to measurements, the Netatmo records accurate indoor and outdoor pressure, humidity, and temperature. However, the measurement capabilities that set this unit apart from the competition are the indoor noise level and air quality measurements. This particular model doesn’t come with an anemometer or a rain collector, but the Wind Gauge and the Rain Gauge are available for purchase separately. All the sensors, built in and optional, feature a special French design. 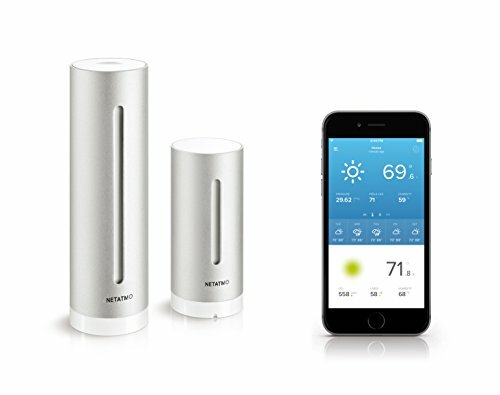 The Netatmo weather station is capable of weekly forecasts and allows users to customize notifications and weather alerts. A reliable weather station can significantly improve your gardening efforts. And, in my opinion, you should not think twice about getting one for your garden. This write-up provides you with some of the best options, but one of them stands out as the best weather station for gardeners. 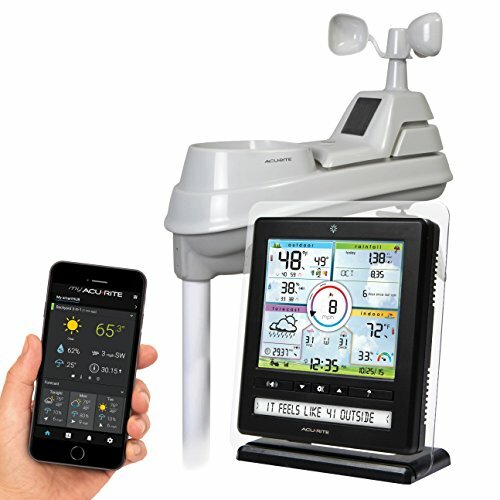 The La Crosse Technology V40-PRO-INT has everything you’ll want in a weather station: excellent build quality, accurate sensors, and reliable Wi-Fi connectivity. In addition, this weather station is also reasonably priced which makes it a great option for most gardeners.